Welcome back to the West Texas Windshield blog! It is predicted that San Angelo could get a nice dusting of snow in the next few days. Since most of you probably don’t even carry an ice scraper with you in your car, we thought we would take advantage of this rare occasion to talk about the most efficient ways to de-ice your car windows. Knowing how to remove ice from your windshield safely can save you a trip to us for a car window repair, even though our team would be more than happy to fix your damaged windshield. Keep reading below to learn these awesome tips! The best way to remove ice and frost from your auto glass is by cranking your defroster setting. While this isn’t always the fastest method, it is the best way to get rid of ice safely while your car warms up. All you have to do is start your car, turn the defrost setting on high on both the front and rear windows when available, and wait while your car warms up. Once the ice begins melting, it will either fully dissipate, or will be much easier to scrape or brush away with an ice scraper. Pick up a jug of windshield wiper fluid that contains de-icer. This type of fluid works well during any time of the year, but will come in especially handy if Mother Nature decides to sprinkle snow across San Angelo. 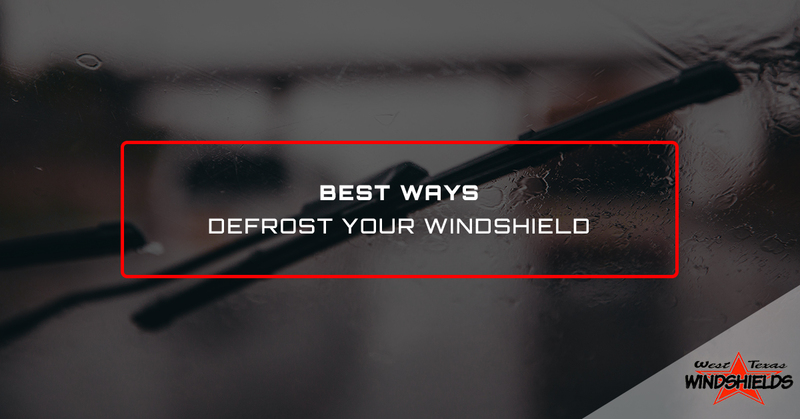 The best way to use this method is to first, start your engine and get the defroster going. Once the ice has melted, spray your wiper fluid so that it helps melt any remaining ice or frost left on the windshield. This method requires knowing ahead of time that snow is on its way. In our case, this is a great method that can make removing ice much easier after it has snowed. Simply grab an empty spray bottle, and mix two parts white or apple cider vinegar with one part water. Keep this solution handy in case you here the weatherman predict an oncoming snow storm. Once you hear the report of snow, go outside and spray your car windows with this vinegar concoction. Lift up your wiper blades so they don’t stick to the windshield the night it snows. When you come out to start your car after a night of snowfall, the ice should be much easier to remove, thanks to the protective barrier that the vinegar spray provided. If you prefer a stronger commercial-grade spray that is mass-produced, purchase a de-icer spray made by Rain-X or Prestone to have on hand in case of snow. You can spray the de-icer spray on the layer of ice to help disintegrate it, making it easier for you to either wipe away with a snow brush, ice scraper, or windshield wipers. Pay attention to the weather and news reports of snow so you know if you’ll be affected. Park in the garage or in a covered space if you can. Invest in a car cover that will not only protect your car windows from becoming covered in a layer of snow and ice, but may also protect the body of your car. Avoid parking underneath branches, or near large shrubs, bushes, and trees that could become weighed down by snow and ice, posing the risk of damage to your vehicle. Run to an auto parts store and pick up an ice scraper with a snow brush, de-icer fluid, and de-icer spray to keep in your car. Grab a bag of ice melt that you can sprinkle on your walkway, driveway, and on the spaces around your car so that you don’t slip on ice while you clean off your car. Pick up a pair of gloves while you’re at it to ensure that your hands don’t freeze while you clean off your car. Whatever you do, absolutely do not pour hot water on the glass to melt the ice. Rapid changes in temperatures can cause damage to the auto glass, and can make existing damage even worse. Also, avoid pouring cold water on the windshield, too. This could be just as damaging. Do not tap on the glass to try and break the ice. This can damage your windshield, and in the worst case scenario, cause it to shatter. While we mentioned using a plastic object like a spatula or CD case if you absolutely have to, it’s better to avoid using anything other than an ice scraper. Avoid using rubbing alcohol to remove ice, which could also damage the surface of the windshield. If we do get snow here in San Angelo, these tips should help you clean off your auto glass efficiently and safely, while also helping you take steps to prepare for the unusual wintry weather. Should your windshield or side windows get damaged by the cold temperatures and ice, call West Texas Windshields for a car window repair or replacement. We will be happy to fix your windshield and get you back on the road.